Mexican food normally appears on our table in some way or form about twice a week. Whether I am serving a simple quesadilla or making a big batch of tamales, I am always in need of a tasty side dish. 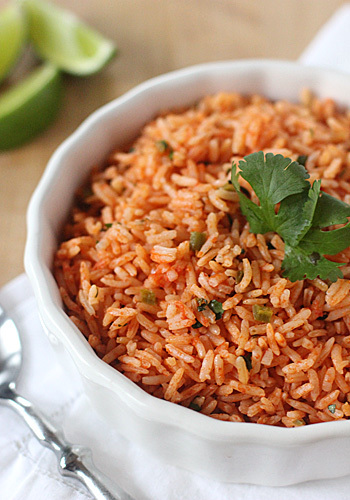 This rice is a favorite for filling the side dish role. The original recipe called for fresh tomatoes, but I cannot rely on the ripeness of tomatoes in the Midwest year-round. Quality canned tomatoes make for an excellent substitute. The recipe also baked the rice in the oven, but cooking rice on the stove-top is quicker and yields the same result. Once the rice is tender and fluffy, it is seasoned with fresh jalapenos to taste, cilantro, and a good squeeze of fresh lime. This is a flavorful dish that will nicely round out any Mexican meal. Process tomatoes and onion in the bowl of a food processor until smooth, about 15 seconds, scraping down the sides of the bowl if necessary. Transfer mixture to a liquid measuring cup; you should have 2 cups. If necessary, spoon off excess so that the volume equals 2 cups. Place rice in a large fine-mesh sieve and rinse under cold running water until water runs clear, about 1 minute. Shake rice vigorously in sieve to remove excess water. In a large heavy-bottomed saucepan with a tight fitting lid, heat the oil over medium-high heat. Add the rice and fry, stirring frequently, until rice is light golden and translucent, about 6 minutes. Reduce the heat to medium and add garlic and half of the minced jalapenos; cook stirring constantly until fragrant, about 30 seconds. Stir in the tomato and onion puree, chicken broth, tomato paste, and salt, stirring until thoroughly combined. Increase the heat to medium-high and bring to a boil. Cover the pan, reduce the heat to a low simmer, and cook until the liquid is absorbed and the rice is tender, about 20 minutes. Remove from the heat, uncover, and fluff the rice with a fork. Cover and let rest for 10 minutes. Stir in the cilantro and remaining jalapenos to taste. Serve immediately, passing lime wedges separately. Enjoy! I am amazed how versatile rice is, and how international this dish is: except jalapenos, this recipe lives in our family for many-many generations! Your recipe is very clear and easy to follow. Thanks! We are on the same wavelength today (again!)... I'm making your Mexican Rice with Red Beans right now (so flavors blend) for dinner tonight. I made a double batch so I could wrap in tortillas this weekend per your suggestion. Still not so good at making tortillas so will be on the lookout for you to post that recipe when you get to it. Keep up the good work! Glad you enjoy the recipe. Funny you mention homemade tortillas...stay tuned next week☺. I have made the Cook's version of this recipe a couple times. I really like what you've done here to streamline it. Thanks for sharing! Mmm, this looks so good. 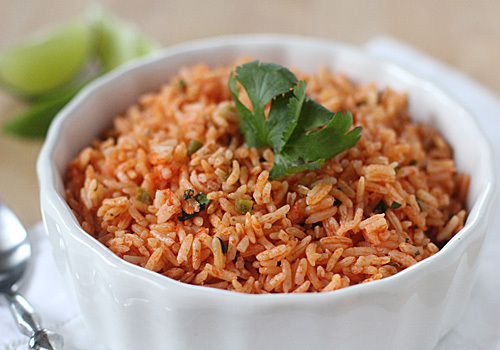 My mom used to make a similar rice every time she made Mexican. It was always one of my favorite parts of the meal :D I'll have to try this. My husband would want a little chili on the side with this...The color is so vibrant too. Some leftovers here and there can also be added. =) Looks yummy! Yumm! perfect for cinco de mayo! Confused? If this is cooked on the stove from beginning to end. What is the reason to have a 350 degree oven on? No reason to have the stove on. That was my error in editing. Thanks for bringing it to my attention☺. This was absolutely delicious! Such a flavorful side dish. I am so pleased you enjoyed it!